Spro's Pro Staff member Bill Siemantel had worked on the Rat project for 2 years and on the opening day of ICAST 2014 all that hard work paid off. Spro's newest addition to the family, the BBZ-1 Rat won Best of ICAST in the hard lure category. 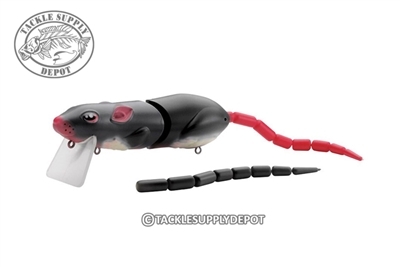 The Spro Rat is designed for those larger predator fish that every angler is looking for. It entices awesome surface strikes by triggering the instinctive reaction that those larger fish are looking for. When the fish are hungry the Spro Rat is the real meal deal! The Spro Rat can be worked in several ways - you can bulge it, v-wake it, walk the dog, pop it or you name it! Bill Siemantel designed the placement of the Gamakatsu hooks so the hook up ratio is incredible. The body construction is made from multiple composites offering excellent durability perfect for handling those bone crushing topwater strikes as well as giving the lure a wood feel. Available in several proven sizes and colors.